Situational awareness: Charles Krauthammer has weeks left to live. "This is the final verdict. My fight is over," he wrote in a note released today. 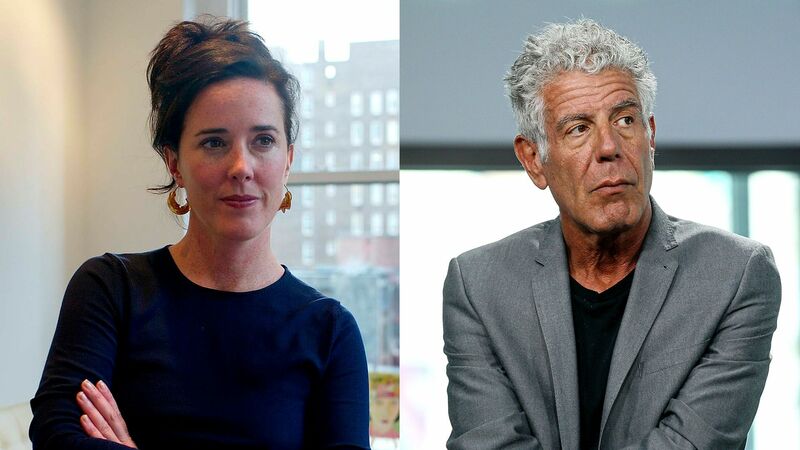 Kate Spade and Anthony Bourdain are gone too soon, the result of suicides that leave the world minus a pair of cultural luminaries. Bourdain, 61, took his own life Friday, while Spade ended hers on Tuesday at the age of 55. The big picture: Suicide rates are up nearly across the board since 1999, as the CDC revealed in a report out yesterday. Middle-aged adults were hardest hit, said CDC principal deputy director Dr. Anne Schuchat. The only exception to the trend: People over 75, NBC News reports. In remembrance: I asked Axions to share what they find meaningful about Spade and Bourdain. "My first birthday after moving to D.C. was my 'golden' birthday — turning 22 on the 22nd. So my mom mailed me a package with all things gold, including a pair of simple, gold, geometric Kate Spade earrings that my sisters helped her pick out... Beside my wedding ring, they are the only pieces of jewelry I wear consistently." "Kate Spade has been my favorite designer for 20 years... My first 'big girl' purse was Kate Spade....To this day, my family still sends me Kate Spade gift cards for Christmas and birthdays. And when all else fails and my husband has no idea what to get me — he knows he can't go wrong with anything that sparkles or has a bow from her store." "If I'm an advocate for anything, it's to move. As far as you can, as much as you can. Across the ocean, or simply across the river. Walk in someone else's shoes or at least eat their food. It's a plus for everybody." P.S. via the NYT: If you are having thoughts of suicide, call the National Suicide Prevention Lifeline at 1-800-273-8255 (TALK). You can find a list of additional resources at SpeakingOfSuicide.com/resources. Trump called for Russia to be reinstated to the G-7. They were booted after annexing Crimea. More Trump comments. New Robert Mueller charges against former Trump campaign chairman Paul Manafort, and Konstantin Kilimnik. Go deeper. Secretary of State Mike Pompeo’s senior aides are hunting for leakers inside the State Department after he became infuriated about several recent news stories. We've got the details. Scoop: Uber is considering a takeover offer for Motivate, the bike-share company behind such programs as CitiBike in New York and Ford GoBike in San Francisco, Axios has learned. A major hurricane in the Eastern Pacific Ocean has intensified from a Category 1 to a Category 4 storm in 18 hours. See the GIF. Each Friday in Axios PM this summer, I'm telling you about a book I've just read and recommend, or one that I'm excited to dive into over the coming weekend. I'll also be sharing your suggestions: Please just reply to this email, or shoot a note to mike@axios.com. And if you know someone who'd enjoy our virtual book club, share this email and suggest they subscribe here. Chapter 20: "I take a deep breath and enter the bar. Inside: banners for the Georgetown Hoyas and Skins and Nationals ... The floors are sticky ... In the back corner, my daughter is seated at a table, surrounded by people — some friends, some who just want to be in the presence of the First Daughter." No spoilers, but a real-life villain is implicated. It's worthy of your time. From the dedication page: "Special thanks to Robert Barnett ... To Hillary Clinton, who has lived with and worked against this threat and the consequences of unheeded warnings, for her constant encouragement and reminders to us to keep it real. ... And to the men and women of the United States Service Service." P.S. Bonus beach read ... "100 Things Capitals Fans Should Know & Do Before the Die," by Ben Raby (Triumph Books) ... #100 is "See the Capitals Win the Stanley Cup."